Women pick up beauty tips all the time from their moms. Learning how to apply the perfect red lip, for instance, is a watch-and-learn kind of sitch, but from their dads? Less so. That is, until shaving your face became the answer to the smoothest skin and easiest makeup application of eh-ver. “The key benefit of using Dermaflash is the exfoliation,” says celebrity makeup artist Daniel Martin. “The device removes the oldest layer of dead skin cells and unwanted peach fuzz.” As a full-fledged proponent of exfoliation, I figure I can’t be considered a true fan until I give all methods a try. Razor, meet face. 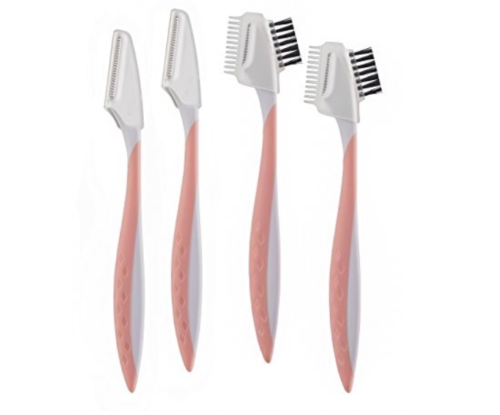 First things first: Face shaving isn’t for everyone: “If you have acne, eczema, or some type of inflamed skin, skip it,” says Mona Gohara, MD, a Connecticut-based dermatologist. “Ask your derm what the best method of exfoliation for you is.” And you shouldn’t be doing this more than once a week—period—because you could cause folliculitis (or enflamed follicles). 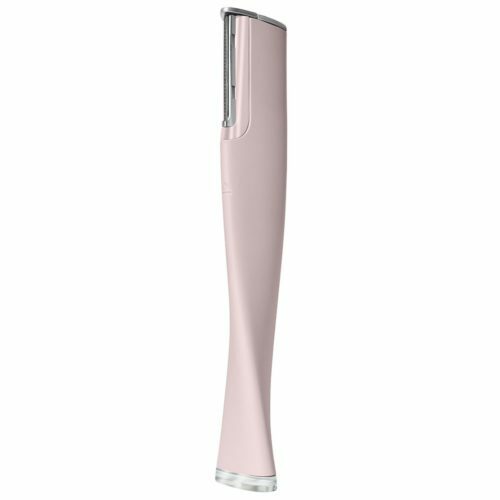 I’ll admit, I’m a little wary as I hold the Dermaflash 2.0 Luxe ($189) in my hand, poised to turn it on and start whirring away my peach fuzz. After all, doesn’t shaving cause hairs to grow back thicker? Nope, says Dr. Gohara. “That is actually one of the biggest myths,” she tells me. “Hair length, girth, texture, and color are genetically pre-determined.” In other words, if your hair feels more prickly than usual, chalk it up to the way your tips feel after a cut versus a month or two down the line. As I flip on the Dermaflash, I also worry that I might nick my face, but one touch of the actual blade to my complexion puts me at ease. It feels less like a sharp, multi-blade razor and more like the texture of a dime if it were enlarged on a straight plane. I carefully move the blade in a top-down motion—going with the grain of my hair—and I watch as itty-bitty fuzz gathers and cascades down my complexion like a tumbleweed. Once I finish an entire cheek, I realize that there was a lot more hair packed onto my face than I’d expected. I touch my skin and feel the silky results: It’s smoother than it’s been in ages. It’s not just hair that you’re removing. “The surface of your skin will be smoother because you’re not only removing the vellus hair that makeup clings to (the peach fuzz), but you’re also exfoliating away the dead skin cells and surface debris that you don’t always get rid of with traditional cleansers,” Martin explains. The missing peach fuzz makes it a piece of cake for skin to lap up the moisturizers and serums that follow. Because there’s no hair for my products to coat, it sinks right into skin and it feels nice to know that my products are able to do their jobs more thoroughly. I become somewhat of a face-shaving addict in the weeks that follow—until, of course, I get lazy for a beat. I use this as an excuse to test the hypothesis that the hair, in fact, doesn’t grow back thicker (BTW, it doesn’t). So, even though mom taught me most of what I know, this one goes out to you, dad. Shop one for yourself, below. Here’s the ultimate skin-care guide for minimalists (or lazy girls). And you can also multitask with these active moisturizers.